For those who have never been there, Plimouth Plantation, site of the village built by the Pilgrims upon arrival in the New World, is a living history open-air museum near Plymouth Rock in Massachusetts. 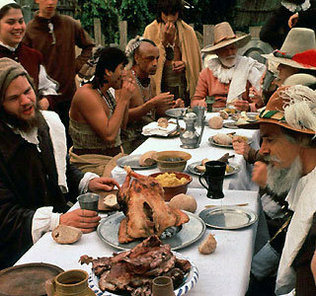 Each actor, or "interpreter," represents as faithfully as possible the life of one of the actual residents of the Plymouth Colony in 1627. It can't be compared to a glitzy theme park or a Murder Weekend; in fact, it feels so authentic that it can be a bit disconcerting to visitors. Chickens and children on stilts or rolling hoops mingle with visitors and characters in the only street. Any character will gladly speak with visitors and try to answer their questions, but only in the framework and words of their character and period. Often they will let young visitors help to knead bread, saw logs, or husk corn. When my daughter was around six we took her for the first time, although our already Epcot-saturated sophisticate was sure it would be a terrible bore. When the blunderbuss-carrying "guard" at the gate greeted us in friendly but archaic terms, she offered him a stick of gum. His response was perfect; he stared at it in wonder, asked what it was, then started to put it, still wrapped, into his mouth. By the time they found enough common language to explain (he seemed to think a wrapper was a garment), she was shaken entirely out of her complacency and prepared for the wonders to come. She watched beading and clam digging, and we finally had to drag her out of the apothecary's when the place was closing. Near the Pilgrim village, you can visit the small 17th-century Indian settlement where actual descendants of the Wampanoags and other local tribes practice the ancestral skills of farming, fishing, beading, and boat building (hollowing out logs by burning) as practiced by their ancestors. It is well worth a visit at any time of year, although autumn is best. Murder at Plimouth Plantation, by Leslie Wheeler, captures a bit of that enchantment. Eighteen-year-old Caroline, niece of protagonist Miranda Lewis, has come from her California home to spend a season at the Plantation "interpreting" Mistress Fear Allerton, a young wife and mother of the Colony. When Miranda, who lives in Cambridge, Massachusetts, calls to check on her niece, Caroline bursts into tears and hangs up on her aunt. Miranda drives down posthaste from Cambridge, but Caroline won't discuss her problem. Next morning, the very real severed head of the ex-policeman who plays Myles Standish appears in Mistress Allerton's work basket, and Caroline becomes the prime suspect. The story is somewhat confusing, overrun with red herrings and several TSTL* moments for both Miranda and Caroline, but the descriptions of the setting and history are accurate and fascinating. In Sarah R. Shaber's Snipe Hunt, recently divorced Simon Shaw is invited to spend a laid-back Thanksgiving weekend at a friend's cottage on North Carolina's rugged Outer Banks. He jumps at the offer–Marcus has a stellar collection of classic paperback mysteries he hopes to explore and three charming children who call Simon "Uncle." An archaeologist friend, David Morgan, has a dig in the area, so Simon travels down in advance and slovenly comfort in Morgan's RV to help sift through what a dredge is bringing up, looking for Indian artifacts. When the dredge pulls up a barnacle-covered body in a World War II-era wetsuit, Morgan persuades the police chief to let him clean and classify the contents of the rubber collecting bucket congealed to the dead man's wetsuit. The body is identified as a local Navy frogman, member of the island's premier family, who vanished in 1942 when German U-Boats regularly patrolled the shoreline, spreading fear of enemy invasion. The man turns out to have been stabbed to death, not drowned, and his collection bucket contained a small fortune in Confederate gold coins, apparently from one of the many wrecked ships just offshore. The story's combination of Civil War-era treasure, World War II local history, and current-day murder make quick and interesting reading. Forensic historian Simon doesn't get the restful long weekend he had hoped for in this well-written second in a series. Whether you share your Thanksgiving feast with one or 30 people, at the beach or a crowded family table, watching (or participating in) a parade or football game, may it be bounteous with food, rich with friends and family, and sparkling with conversation. And maybe sometime over the weekend, with some time to pick up and enjoy a good book. Plimouth Plantation sounds like a most wonderful place to visit. It will be quite a while before I get there so I will happily settle for reading these interesting books!